We’d love your help. 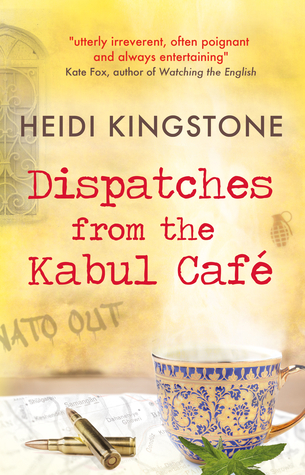 Let us know what’s wrong with this preview of Dispatches from the Kabul Cafe by Heidi Kingstone. Where can you buy 913 Kalashnikovs? How do you tell a friend her expat love is never coming back? What’s it like to date a mercenary? In 2007, Canadian journalist Heidi Kingstone arrived in Kabul, eager to uncover the mysteries and shadows of one turbulent corner of the world. Over the next four years, she encountered idealists and chancers, gunrunners and warlords. She in Where can you buy 913 Kalashnikovs? How do you tell a friend her expat love is never coming back? What’s it like to date a mercenary? To ask other readers questions about Dispatches from the Kabul Cafe, please sign up. Dispatches is a beautifully-written, innovative and original piece of travel journalism which is well worth a read. What I really like about this book - apart from the descriptions of Kabul, its landscape and its people - is the fact that the author gives women a voice through her writing style. Not just women in Afghanistan, but women everywhere, through being true to the feminine perspective. This is how women perceive a war, and the brutalities and horrors which accompany that war. Heidi Kings Dispatches is a beautifully-written, innovative and original piece of travel journalism which is well worth a read. What I really like about this book - apart from the descriptions of Kabul, its landscape and its people - is the fact that the author gives women a voice through her writing style. Not just women in Afghanistan, but women everywhere, through being true to the feminine perspective. This is how women perceive a war, and the brutalities and horrors which accompany that war. Heidi Kingstone has a guttural visceral style. She writes with emotional intelligence and in this respect Dispatches is very refreshing. The book reads like a travel diary as well as social and political comment on a war zone whose people have been ripped apart - both from the inside and the outside. But the author also manages to convey the humour and warmth of the Afghan people - because they are extraordinarily warm and humorous and have suffered indescribably (as we know). Heidi Kingstone's account is also very informative and thorough; she tells the story of Afghanistan through human stories - the stories of the women she meets, and her own story, the experience of being a freelance journalist in Kabul. The genre is similar to Michael Palin's travel diaries, and in some respects is part of a new genre that may be developing - travel journalism which tells the human story but from our marginalised female perspective. Sure, we've all seen Christiane Amanpour bundled up in a bullet-proof vest reporting from the streets of a red-hot war zone. But it's rare to read about daily life in a war zone from a western woman's highly-personal perspective. Not just from the streets, but from cafes, drawing rooms and even bedrooms. We have beautiful childhood accounts such as the Diary of Anne Frank and I am Malala as notable examples of how war affects the female mind and heart. But as a woman over 30, reading Heidi Kings Sure, we've all seen Christiane Amanpour bundled up in a bullet-proof vest reporting from the streets of a red-hot war zone. But it's rare to read about daily life in a war zone from a western woman's highly-personal perspective. Not just from the streets, but from cafes, drawing rooms and even bedrooms. This is a very educational and interesting read! Heidi Kingstone offers an incredible insight to life in Kabul during the attempt by NATO to try and develop and bring peace to Afghanistan. She describes the banality and ordinariness of life juxtaposed against a war-torn country and the difficulties presented to women there. Kabul is fine "until it isn't" and peace can turn to terror in an instant with suicide bombers and other threats that come with living within a fundamental theocracy. She desc This is a very educational and interesting read! Heidi Kingstone offers an incredible insight to life in Kabul during the attempt by NATO to try and develop and bring peace to Afghanistan. She describes the banality and ordinariness of life juxtaposed against a war-torn country and the difficulties presented to women there. Kabul is fine "until it isn't" and peace can turn to terror in an instant with suicide bombers and other threats that come with living within a fundamental theocracy. She describes well the complexities of development in a country steeped in the 7th Century... Her style is succinct and direct. You will come away with a clearer understanding of the country and what went wrong with trying to develop a primitive nation that once thrived. Heidi Kingstone has written a stunning book. I came across it by pure coincidence on Twitter. I learned so much, not at least how little I know about the world. Heidi excels in describing what life is like in Kabul and how badly things have developed over the past years. Her experience of living in Kabul, the people she met and the relationship she developed, are so much richer than any report about Afganistan on TV. I highly recommend Heidi's book. It is also more than worthwhile visiting the we Heidi Kingstone has written a stunning book. I came across it by pure coincidence on Twitter. I learned so much, not at least how little I know about the world. Heidi excels in describing what life is like in Kabul and how badly things have developed over the past years. Her experience of living in Kabul, the people she met and the relationship she developed, are so much richer than any report about Afganistan on TV. I highly recommend Heidi's book. It is also more than worthwhile visiting the website related to the book where Heidi Provides more information about places and people featuring in her book. Hugely entertaining memoir by a smart and sassy author. The book is made up of a series of mini adventures, anecdotes and character studies about people the author - Heidi Kingstone - encountered during her four years in Kabul (from 1997-2001). It is funny, intelligent, cheeky and insightful all at once and it is a perspective on Afghanistan that noone else will give you. Great book. PS. My fellow countrymen and countrywomen (Aussies) who feature in this book are... well... nutters. Fabulous nut Hugely entertaining memoir by a smart and sassy author. The book is made up of a series of mini adventures, anecdotes and character studies about people the author - Heidi Kingstone - encountered during her four years in Kabul (from 1997-2001). It is funny, intelligent, cheeky and insightful all at once and it is a perspective on Afghanistan that noone else will give you. Great book. I haven't been able to read a book in months. I started Dispatches from the Kabul Cafe in hopes that it would help with my research on Kabul... It didn't help as much as I had hoped but, it was a brilliant read. Thank you, Heidi Kingston, for sharing your incredible experience. I couldn't put this book down. If you are like me and read a lot from the romance genre, and are maybe looking for something to cleanse your reading palette, Ms. Kingstone's memoir of her time in Kabul is an absolutely bri I haven't been able to read a book in months. I started Dispatches from the Kabul Cafe in hopes that it would help with my research on Kabul... It didn't help as much as I had hoped but, it was a brilliant read. Thank you, Heidi Kingston, for sharing your incredible experience. I couldn't put this book down. Ch15 is a beautiful letter from your friend Zaman, but who is he? How do you know him? Is he an Afghan journalist? Where did you meet him? How did he escape?I'd love to hear more. Insightful, but somewhat disjointed, with the 'dispatches' more random jottings and thoughts than 'From Our Own Correspondent'. I enjoyed this book, but also found it a little frustrating, some decent editing would probably have helped, it felt more like a cathartic exercise for the writer than something produced to inform the reader. This review has been hidden because it contains spoilers. To view it, click here. Nice, easy book to read. It is not well written, but it is a compilation of real-life stories of life in Afghanistan from the point of view of the ex-pat community. It has a very beautiful description of Band-e Amir lake near the town of Bamiyan where the Taliban destroyed two 80m statutes of Buda. One day, when peace returns, I would love to visit that area.